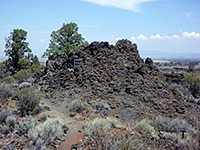 Most of the best volcanic features are concentrated in the south of Lava Beds National Monument, although the scenic drive in the north passes by Tule Lake National Wildlife Refuge, good for bird watching, and also in this region are several historic sites dating from the Modoc War of 1872. In this campaign, the US army fought a group of local Indians who refused to leave their traditional lands in this part of California in exchange for a reservation in Oklahoma and although they held out for a while, hiding in the lava fields, all were eventually captured or killed. 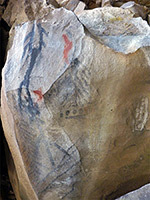 One additional area of interest is to the northeast, where a small disconnected section of the monument contains a cliff with ancient Indian petroglyphs. 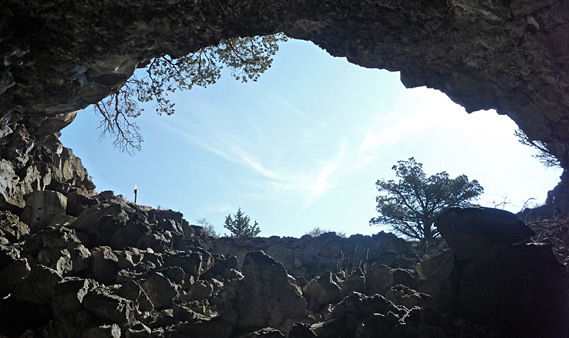 The lava tube caves are the most visited feature, and a group along a one way loop road near the visitor center have been developed for public access; over a dozen are signposted and are mostly quite easy to explore, with steps constructed at the entrance and some other steep places. There is still an element of risk as the caves may be narrow and require exploring on hands and knees, or have floors made of unstable, sharp lava blocks. Often they have many branches that can be quite confusing at first although all interlink and head in the same general direction. Lights are required and hard hats are advisable; both may be rented at the visitor center. 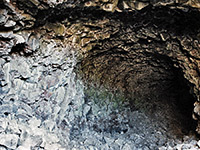 There is a wide variation in the conditions underground - some caves have large passages filled with boulders from collapsed ceilings, while others have a much fresher appearance with smooth sides, a perfectly round cross-section, rippled lava floor and tidemarks from previous flows along the walls. The NPS has installed electric lights, informative signs and a walkway in one short cave (Mushpot) next to the visitor center, so this is a good place for explorations to start. The others along the loop road present a range of features, such as the following: Sunshine is short but quite large and has 2 openings in the roof that allow for plants and flowers to grow where the sunlight enters. Sentinel is a long cave with 2 entrances half a mile apart and passages on several levels. Catacombs is the longest system - a convoluted network of criss-crossing tubular passages that extends deep underground and becomes increasingly difficult to follow as the openings become narrower. Away from the visitor center, the monument has plenty to see. The approach from the southeast entrance passes perhaps the most beautiful cave in the whole region, Valentine, in which the passages branch several times and are especially smooth and curving, interrupted in places by lava pools and cascades. In the southwest, along the road to Medicine Lake, a path leads to the Heppe Ice Cave - actually three separate openings that radiate from a deep, crater-like, boulder-filled depression formed by the collapse of a larger cave. Further south, in wooded country just before the monument boundary is the impressive, sheer sided Mammoth Crater, the source of much of the lava flows in the monument. There is a short trail to a viewpoint on the south rim but no path down. On the opposite side of the road, Hidden Valley is a steep-walled ravine with large ponderosa pine trees growing in ashy soil beneath cliffs of lava, and has a pleasant footpath winding through the glades. To the north various side roads branch off the main scenic drive to other caves including Skull and Merrill, both of which have passages on two levels with ice floors in the lower chambers although these have been melting over the last few years and visitor access may be restricted. 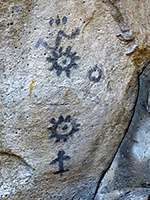 The road to Skull Cave also passes the trailhead for the 0.9 mile path to Big Painted Cave and Symbol Bridge Cave, both of which contain a varied assortment of pictographs; ancient designs painted in black, grey and red on some of the basalt boulders near the cave entrances. 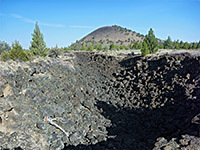 A little further north, the black cone of Schonchin Butte rises 600 feet above the lava beds. At the top, built on an outcrop of red lava blocks, is a fire lookout station, and a hike to the summit offers excellent views over the whole monument and beyond to Tule Lake and the Medicine Lake Mountains. On most days Mount Shasta can be seen, 15 miles to the southwest, and in clear weather even the Crater Lake volcano is visible, 80 miles to the north in Oregon. The climb takes just 20 minutes, up the east side which has bushes and a variety of wildflowers, in contrast to the west face that is just bare ash. No hiking is allowed on this slope, or on any of the other cinder cones in the monument. 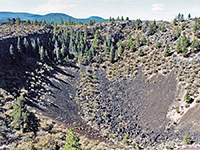 The last major volcanic feature is a collection of colorful, jagged lava piles surrounding several spatter cones known as the Fleener Chimneys, which several thousand years ago produced the 4 mile Devils Homestead Lava Flow (the rough aa type of lava) that extends from here northwards. Past this location, the remainder of the scenic drive passes scattered lava deposits with roadside viewpoints and several historical sites.